2 nights for 2 adults + 1 or 2 kids up to 17 years old in Junior Suite. Easter lunch with view over Lake Garda (drinks not included). 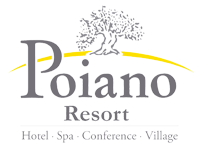 Special price for dinner at Poiano Restaurant: € 25 per person instead of € 35 (drinks not included). 1 entrance of 3 hours per adult to Poiano La Spa Wellness Path (salt water lagoon, sauna, hammam, emotional showers) and babysitter for children. Kit Spa (bathrobe, towel and slippers). Price for the additional night: € 173 room with breakfast. Package price: from € 189 per person.